CheckScan Pro is a fully automatic, high speed check endorsement and imaging system with archival capability. 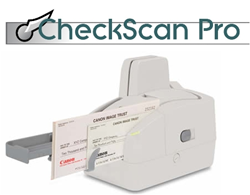 Data Financial, Inc. announces the release of CheckScan Pro, now in its second generation, CheckScan Pro is a fully automatic, high speed check endorsement and imaging system with archival capability. The CheckScan Pro check endorsing software will endorse an unlimited amount of checks, scan the front and back image into a database, read and store MICR line data and provide a simple research utility. Checks can be researched by date or by account number. “The need for dependable check endorsing equipment is constant, even as many customers move to systems which electronically deposit checks,” according to Jim Holtz, President of Data Financial, Inc. “While we first brought this product to market to address a specific industry need, we quickly determined the demand for affordable, high speed and dependable check endorsing/imaging equipment among industries including charitable organizations, universities, insurance companies, manufacturing and medical facilities,” Holtz said. The product is available for use with any Windows based PC. Designed to be user installed and fully operational in minutes, CheckScan Pro users can expect to process checks for bank deposit in a high speed environment utilizing the quality of Canon or Digital Check scanning hardware. An integrated auto-feed system enables processing of checks at a speed of up to 1500 documents per hour with changeable endorsements on demand. CheckScan Pro reads and stores all MICR information for review, reporting and research. According to Holtz, the company has installed CheckScan Pro throughout city government offices, churches, veteran’s affairs offices, public utilities and other unique users who share the common need to endorse, scan and record check information efficiently and accurately. Holtz continued, “We know that check endorsing continues to be a common business practice and is most often done manually. As we worked toward automating this tedious function, we recognized the value in imaging the check while it is being endorsed would be a welcome addition.” The scanning of both the front and back of the check, along with the reading of MICR information provides a permanent record offering multiple research abilities. CheckScan Pro is available on line at http://www.datafinancial.com/checkscan-pro.html and is fully supported by Data Financial, Inc. The product is shipped free of charge and is furnished with a one year comprehensive warranty. Data Financial, Inc. offers free customer trials. Founded in 1983, Data Financial, Inc. provides products, systems solutions and custom software to commercial, banking and gaming customers. A consulting and technical staff advises customers about check processing products and software, currency and cash products, document security solutions, archive tools and system and software design to meet specific financial and business needs.